A modern house sprinkled with bright and beautiful colors on the inside is a treat for the eyes and hardly needs any more decoration. 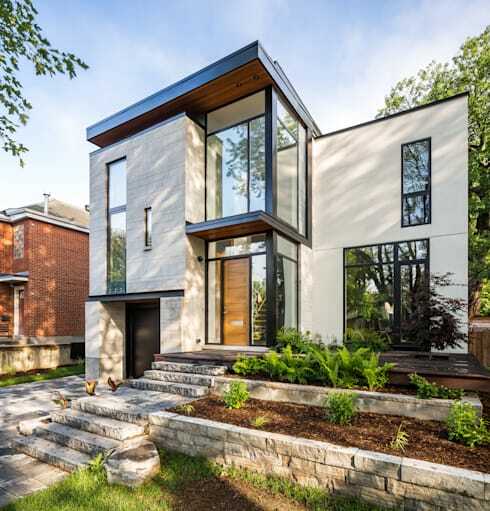 Here is a modern, luxurious and great looking house on the inside and outside with comfortable interiors that are sure to lure you into renovating yours. The design in straight lines makes this house look simple and elegant from the outside, and is beautifully and artistically decorated inside. Let us have a look. The house looks modern and minimalist from the outside, with neatly painted walls, and generous use of glass. The exterior of the house makes it look compact and simple, giving it a very modern look. 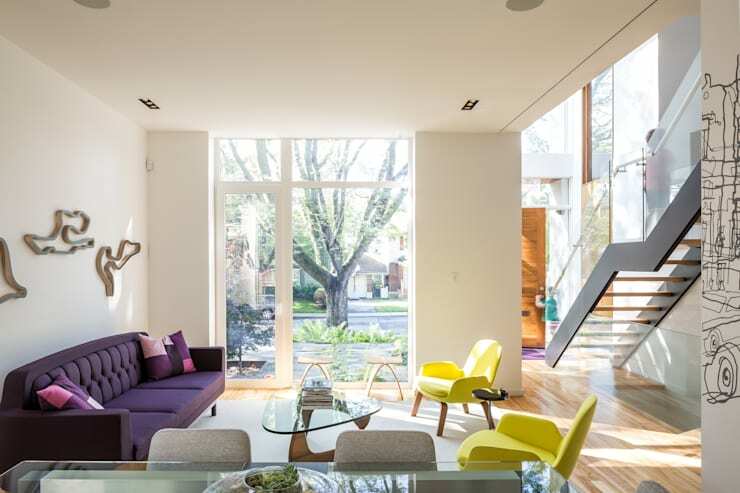 The wall sized windows of glass allow a lot of natural light, keeping the interiors looking fresh and bright. The simple dining table made in glass with chairs in white are the perfect symbol of minimalism in the decor of the dining room. 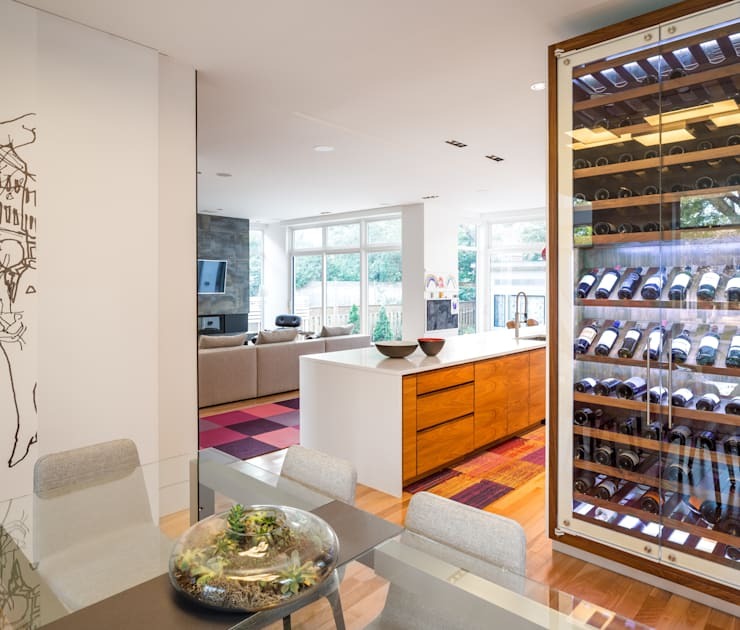 The wine rack in wood and glass inbuilt in the kitchen cabinet frame facing the dining table, is a great space saving and unique idea, and is without a doubt the focal point of the dining area. Here are the dining room decor ideas from all around the world, see which one inspires you. The kitchen is designed in all white and some wood, without many overpowering elements. The center island has a basin, a preparation area and also acts as a small breakfast table. The kitchen is superbly illuminated by natural light, however the hanging lights over the breakfast side of the island add glamour and focus on to the area. Here you will find 12 clever hacks that every kitchen needs. The media room is decorated in earthen and neutral colors with subtle yet bright contrasting highlights that add magic to the room. The wooden flooring keeps the room warm and natural. The natural sun light that brightens up the room adds texture with creates natural shadows. The center table in wood blends well and maintains the subtlety, and the colored ottomans steal the focus in the room. 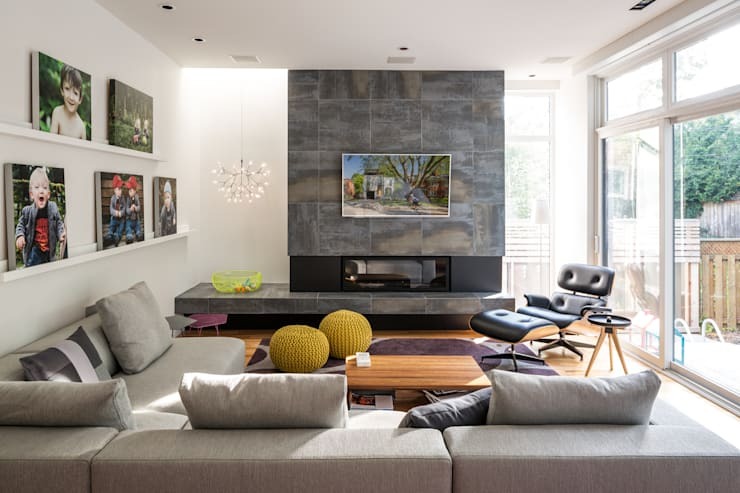 The living room sports a bright purple sofa, with matching cushions and yellow chairs to create a vivid contrast and make the room feel peppy and bright. The use of these bright colors add energy to the room, and the full sized glass door keeps no hurdles for natural light. The living room shines in bright colors and white background. If you are looking for some affordable ways to make your living room lavish, don´t miss this ideabook. A walk in closet with shelves, wardrobes and drawers to arrange each and everything in the right order is what many people dream of. It helps in keeping the house organized and gives such a larger than life feeling to usual living. Love this organization? Here are 9 smart and creative ways to organize your shoes. The design of this house even allowed to create a small landing midway both the floors, where the piano and chair are kept for the music lover residing in the house. 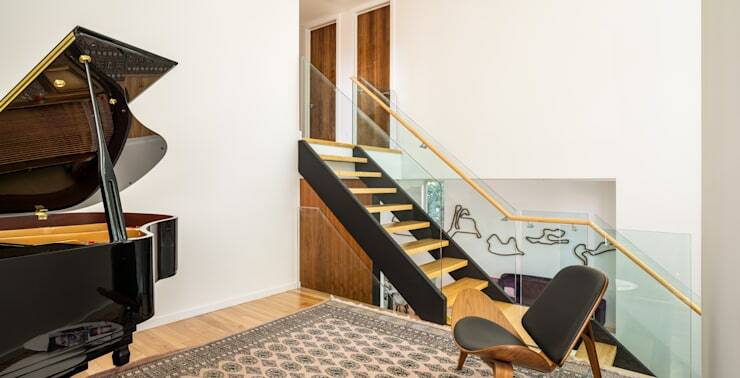 The stairs, piano and the chair complement each other beautifully creating a coherent ambiance. Just when you feel that the house can not surprise you any further, there is a swimming pool on the back side of it. The pool is surrounded by a great looking and comfortable seating arrangement to relish in all weathers, with friends and family and fresh air. Thinking about getting a pool in your home? Here is what you need to know to build it. Full of surprises and the beauty of colors! Let us know your thoughts, how you liked it! The first step on the way to your own pool in the garden is to find the right location. In addition to a level location without larger plants and obstacles, factors such as the sun's rays and sufficient protection against windy winds and prying eyes play an important role. 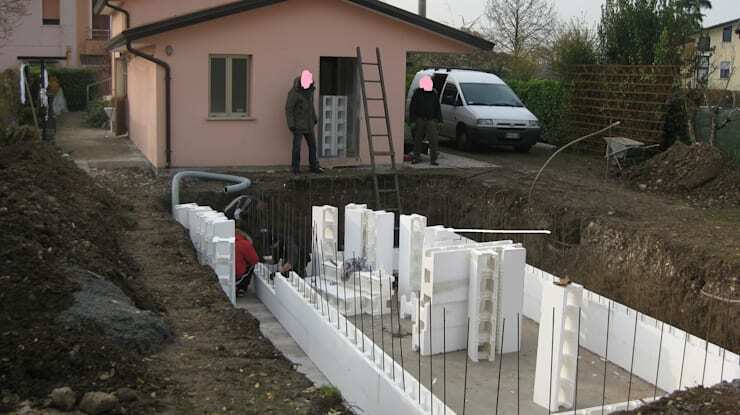 Once the perfect location has been found, the excavation pit is excavated, a substructure is created and finally the foundation plate is installed.